Jumbo Bakery Style Muffins are one of my favorite things about getting muffins from a bakery or coffee shop because they are HUGE. It is such a treat to have an enormous muffin and an iced caramel macchiato. If I didn’t have to worry about my waist sizing increasing and my bank account shrinking I would order both every day. Seriously. Every day. Awhile back I bought a jumbo muffin tin and if you can believe it after making a couple batches of jumbo muffins it got shoved to the back of the cupboard and it was long forgotten. Do me a favor go open up your cupboards and tell me what type of odd baking pans are back there. I can’t be the only one. I dug in the cupboard and pulled out that dusty jumbo muffin tin for this recipe and I am so glad I did. How do I get inspired to create a recipe? Usually, it has to do with current food cravings either my own or my family’s, what I have on hand, and what needs to be used up soon. I knew I wanted to do a banana nut recipe because I had three bananas that were incredibly ripe. Banana bread is such a great go-to but I already have many banana bread recipes (whole wheat, low fat, banana walnut) and I also have a couple banana + chocolate recipes (chocolate banana muffins, marbled chocolate banana cake). One thing I didn’t have was a JUMBO bakery style muffin recipe. I didn’t want to put regular banana muffins in my jumbo muffin tin and call it good. What I wanted was a lofty sky-high muffin. After a quick Google search, I came across Sally’s Bakery-Style Muffins which was just what I was looking for. Using Sally’s recipe for inspiration and the ingredients I had on hand I created muffins of my dreams. 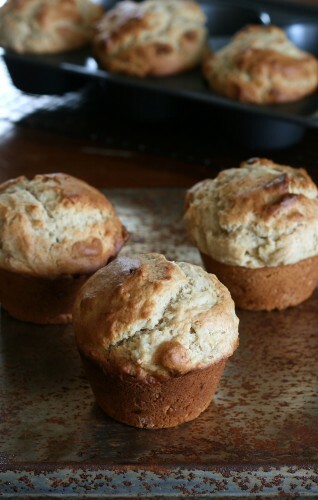 These are the lofty-sky high muffins I was looking for, the outsides are crisp and the insides soft and tender. You will love them! Just look how huge they are. Sally says the extra baking powder plus baking them at a higher temperature for a brief period helps give them that extra boost that makes them look like professional bakery style muffins. If you haven’t tried coconut butter yet I recommend giving it a try on these muffins. The slight coconut flavor pairs well with the bananas and walnuts. Preheat oven to 425 degrees F. Spray muffin tins or place jumbo liners into the muffin tins. In a medium bowl mix together eggs, sugar, buttermilk, oil, bananas, and vanilla. Fold wet ingredients into dry ingredients. Mix until just combined. Stir in walnuts. Careful not to overmix. Bake at 425 degrees F for 5 minutes. Reduce temperature to 375 degrees F and continue to bake for 25 minutes. Cool in muffin tins for 5-10 minutes before serving. I recommend a nice slather of butter. 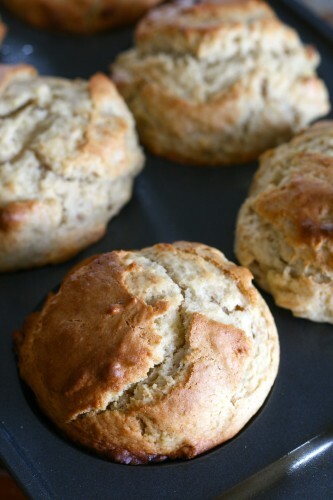 Muffins are one of my favorite breakfast foods so I love how jumbo and delicious these look! I have not tried coconut butter and I am thinking I will love it!!! These muffins look amazing. 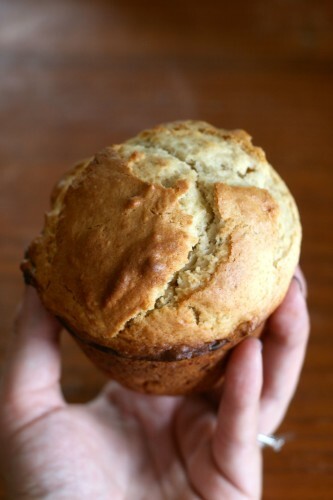 I love jumbo muffins…most of my muffins I make are jumbos and its just so satisfying at breakfast. Amazing! Simply amazing. I love what you did with my muffin recipe. I have to try a banana version ASAP. Yours look so good. And I love coconut butter! I love muffins too and I have a ton of versions on my site, but not one like this – so I’m totally going to try it. 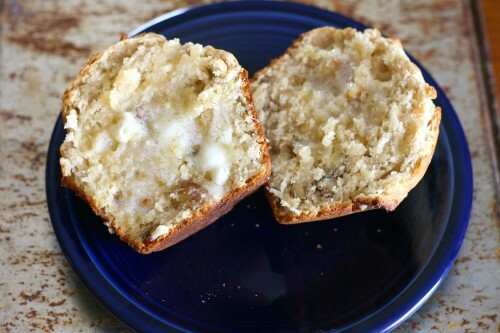 I make a jumbo cinnamon muffin for @ 250 calories that is delish! Theses were perfect! I’ve never made muffins that turned out so pretty! So thank you to you & sallysbakingaddiction.com. I love her site! And yours, too! Just took these out of the oven! They are everything you say they are! Lofty. Soft. Flavorful! Easy and quick! I liked this recipe because I didn’t want to bother with the topping that seems to be on most banana nut muffins. These do not need the topping. I will make these again! Thank you! Okay I’m a little late to the party, but I just found this recipe and made them. These are INCREDIBLE. They are huge, fluffy, and wonderful!!! I’m obsessed!!! I am so happy to hear that. They are a favorite in my house! Thanks for popping back to tell me. I want to try this recipie but I don’t have buttermilk, is there a substitue I can use? You can use 1 TBS vinegar and/ or lemon juice and enough milk to make 1 cup, let sit for about 5 minutes before using. I’m glad you found me Susie 🙂 I hope you enjoy those muffins. Gotta love a jumbo muffin! Perfect texture and not too sweet. This recipe is a keeper. Thanks Kacy! I know they are a big winner in my house! 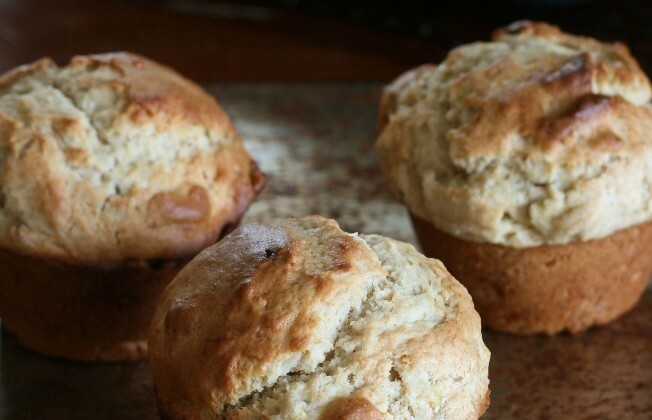 These muffins plumped up great. I definitely needed to add salt. Thanks for the feedback, GP! These were not good. I followed the recipe and they turned out very bland. They looked fantastic but were not good. Threw the rest away since no one would eat them ☹️. I love giant muffins and these are perfect! Made them in a 6 muffin tray. Beautiful! Should these be stored in the fridge? Sure loved how they turned out! You certainly could store them in the fridge. I never do because they are usually gone within a few days. I just keep them in a ziplock or Tupperware container on the counter. Since making these I have had nothing but compliments! This recipe needs no tweeting by me. Thanks! These muffins are totally excellent! I subbed some of the all purpose flour out with a whole wheat and coconut flour mix just because I like to experiment, but this recipe needs no tweaking. Thank you for sharing! In your list of ingredients it says baking soda but the recipe calls for baking powder. Which one is used please? Oh goodness! Good catch! It is baking powder. I will edit the recipe accordingly. How would you adjust for a cupcake tin??? My tiny apt can only hold so many things in the kitchen!! This is a terrific recipe. I followed directions trading pecans for walnuts ( all I had on hand) and they are delicious. Although they looked amazing when they came out of the oven these muffins turned out a little too dense for my liking & they didn’t have much flavor. I followed the recipe to a “T” and they were not a hit my house 🙁 .